The last time I visited Waitewaewae Hut (aka YTYY), I was on my first ever trip with the Wellington Tongue and Meats. 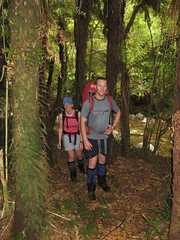 This had been the easy-rated trip up Saddle Creek from Otaki Forks, and considering Andrew was in charge, I think as many people had gone for the cooking as for the walking. With a large group of 12 people, the track that was signposted as 4 hours ended up taking us more than 7, and several people on their first ever tramp were feeling almost dead at the end of it. This weekend there was another group from the club doing a similar trip to what I’d done earlier, but personally I was in a separate trip coming into Waitewaewae from the other end. 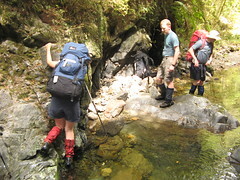 Our basic plan was to start from the Waikawa Stream, meet the other group at the hut on Saturday night, and then we’d all walk back to Otaki Forks on the Sunday. 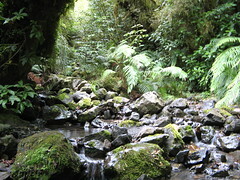 Location: Tararua Forest Park, North Manakau Road to Otaki Forks. People: Steve, Lesley, Kerry, Marie, Andy, Sylvia, Dave, Sue, Allen and me. Huts visited: Waitewaewae Hut (1 night). 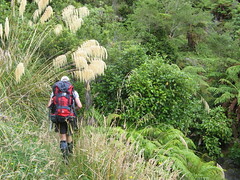 Intended route: Begin at the end of North Manakau Road, follow the Waikawa Stream and pick a spur towards the saddle north of point 673. Continue down the other side into the West Waitewaewae River. 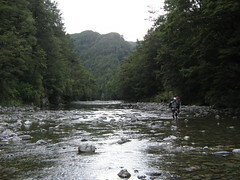 Follow it to Island Forks and along the main Waitewaewae River to the Otaki River. Carry on to Waitewaewae Hut. 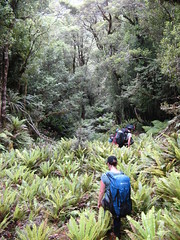 Then out via the main track over the plateau and along Saddle Creek back to Otaki Forks on Sunday. Related bits: Dave also wrote a trip report about this weekend. It was a complicated transport arrangement on Friday night. Steve (from our group) was the only bus driver available, so it was necessary for him to drive the bus to Otaki Forks to drop everyone off, after which the remaining ten of us piled into the van and set off for the North Manakau Road-end, some distance further north. Both road-ends are windy and bumpy and have to be negotiated slowly, and it took quite a while for us to get to our starting point. At the end of North Manakau Road, we were quite surprised to find both a long drop, and a concrete barbecue, but not much else. Maybe it’s a popular place for people to camp for the night before setting off. The large fly goes up. We arrived shortly after 9pm and, after noting that there wasn’t really anywhere useful to walk to on a Friday night, we set to work putting up the flies. There was plenty of space, but the ground was far too hard to knock in any pegs, so we had to find some heavy rocks to weigh them down. The problems compounded when we realised that the main guy rope on the large fly we’d brought with us was a couple of metres too short. It almost got to the point of having to yank out some bootlaces to tie it down, until we figured out that it’d be feasible to tie one end directly to the van. The large fly was properly up by about 9.45pm, and with the front of the van sheltering one end of it we even managed to cram seven people under it quite comfortably. People were stirring a little after 6.30am or so on Saturday morning. Allen had a billy boiling before long for everyone who wanted hot water, and after an hour or so we were packed up and ready to get going. The North Manakau Road-end actually has two obvious exits. One of them, on the left of the road when facing the end, is signposted as some kind of bush-walk and immediately starts going up-hill. I don’t know where this track goes, and we went the other way, which basically continues straight ahead into the trees from the end of the road. This track goes straight down towards the Waikawa Stream, which was where we wanted to be, towards the site of one of the Tararua’s old logging mills. We’d hit the river within 3 or 4 minutes, and even though there’s a track marked along the river’s true right to the old mill site for about a kilometre, it wasn’t very distinguishable to me from the river itself. Personally I never even noticed the site of the Old Mill. I’m unsure if this is because I wasn’t looking hard enough, or if there’s just not much to see. Navigationally speaking, the entire trip was likely to be quite straightforward. The plan was to follow the Waikawa Stream south for a couple of kilometres, then head up a spur to a saddle, which was also pretty much south-wards. It was a good place to practice navigation techniques, though, and several of us had maps and compasses out to try and pick up the variations in the stream. The stream did have a few kinks in it to throw us off, and at one point we nearly headed up the wrong side-stream, and only realised after a bearing found us somehow heading north-west. Looking at the map, though, it would have been difficult to take a wrong turn that didn’t eventually take us to where we wanted to be anyway. Allen and Sue, of course, had been all around just about everywhere nearby except for this particular stream. If we’d found a way to get lost, we would have known because they would have begun to recognise where they were. They probably wouldn’t have told us, though. We found what we thought was the right spur at about 9.40am, and there was even a bit of a track worn around it. At first, the track seemed to go more alongside the river rather than up the spur, but it eventually headed up, and we were on what I presume was the saddle at about 10.35’ish. After a small amount of surveying to check if we should be heading either way along the ridge, we ended up heading straight down the other side, and into the West Waitewaewae River. The descent took about 30 minutes, and we stopped for a natter and a short snack at the bottom. The West Waitewaewae River is a little gorgey in places, and within about ten minutes we were wading through knee-deep water for the first time. As things go there wasn’t a lot of water in the river, though, and it was quite a nice and gentle walk under the trees. The group stopped for lunch shortly before 12, and with quite a lot of time to burn, we boiled some more water and took a 30 minute break. After lunch things became a lot more gorgey, intermittently at least. At about 12.45, we came across our first part of the river that looked a little difficult. It was a section with a small waterfall that looked deep underneath, and had steep walls on either side. Dave and Andy were the first to climb around the edge. They didn’t make it look easy or particularly safe, either. I was starting to consider my first practical attempt at pack-floating at about the time that Sylvia got everyone’s attention by mis-placing something and falling backwards into the river from the wall above. Sylvia was fine (apart from being a little saturated), and when she stood up it became more obvious that the depth wasn’t much more than waste deep. Steve and I ended up just wading through, while I think everyone else found a convenient ledge about knee-deep under the water which was a little easy to sidle around. 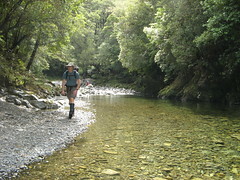 We were walking again at 3.35pm, with the next phase of the trip being about 5 kilometres along the main Waitewaewae River to where it flowed into the Otaki River. The main river continued the occasional gorginess, resulting in more places where we needed to wade through waist-deep water. This also contributed to the number of good swimming holes that we walked past. We didn’t stop for any swimming in the end, but it might be worth remembering for the future. There’s a big slip marked on the map about half way along that stretch, which we’d reached by 5.10pm at our fairly relaxed pace. It was starting to get later in the day now, though, and notably the sandflies were starting to hover around the water, biting when given the chance. We weren’t too far from the hut by now, which was evident by the increasing numbers of footprints visible in the sand, suggesting that this part of the river was getting to be a little more populated. For a while, however, we were still considering camping for the night. The weather was calm, and we walked past quite a few possible campsites in the flats alongside the river. We never did stop, however, and secretly I was quite glad inside. Camping would have been nice, but I’d only just renewed my annual hut pass the previous Tuesday, and somehow staying in a hut somehow seemed to justify this. We finally reached the Otaki River at 5.45pm. From here it was a short jaunt further down-stream to the swing bridge, 15 minutes away, where we stopped to re-group. We were all over it by about 10 minutes later, including Marie who put on a small circus act by holding her pole in her mouth, and were settling into hut life by 6.20pm. Overall it was a good day, apart from Kerry’s injury which was still bothering her. I think the only irritation for me was after I pulled off one of my gaiters and discovered that one of the lace brackets from my boot had fallen off, probably in the West Waitewaewae River since I think that was about the time I thought my lace had come loose. It’s probably washed well out to see by now. Already at the hut for the night were a couple with a friendly dog, who were camped outside, and a family group of four who were currently preparing dinner and playing card games. What we didn’t find, against our expectations, was the other group. Considering how late it was in the day, this seemed strange and a little concerning, especially after the dog couple told us they’d overtaken the group at the log hauler near the start of Saddle Creek back at mid-day. As we heard a helicopter fly overhead shortly after our arrival, we joked about how it might have been for them. Waitewaewae Hut was very similar to how I remembered it from September 2006, the only obvious difference being the movement of the long drop. (The track to the previous location has been filled up by a large tree branch.) 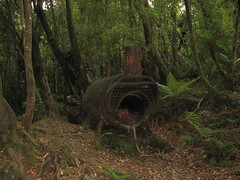 The current Waitewaewae Hut itself has an interesting distinction of being the first hut that New Zealand’s Department of Conservation funded the building of using the fees from back-country hut tickets. This was a demonstration in 1991, in response to a lot of controversy over the introduction of hut fees, shortly after the department usurped control of the country’s National Parks and Forest Parks, and whatever was in them. To quell some of the complaints from many people who objected to being charged for use of the facilities that they themselves had spent time and effort building and maintaining, the government department wanted to demonstrate that those fees would actually be spent on supporting recreational activities. Consequently, Waitewaewae was rebuilt. Although there less objections to the payment of fees after 17 years, the hut book at Waitewaewae still gets the occasional comment from someone complaining about how they feel insulted for being asked to pay them. We settled into a couscous dinner, and as we waited for the other group, I flicked through the hut copy of Ross Kerr’s A Chronology of the Tararua and Rimutaka Ranges. Sue meanwhile explained to one of the other people at the hut just where we’d come from that day, pointing to a stream on her Tararua map which I noticed was covered in a very comprehensive grid of drawn lines. The other group still hadn’t arrived by the time we went to bed after several hours. It was quite possible they’d had a minor mis-hap, so we assumed they’d probably just stopped and camped somewhere along the way, or returned to Otaki Forks. For the entire day, I’d been expecting to be sleeping on the floor. I felt a little guilty snatching a mattress on the so-far completely vacant top level. It was tempting to sleep on the deck outside and a couple of people almost did, but everyone was inside by the end, even though Steve and Marie preferred to stick to the floor. It may have been just as well that everyone was inside, as there was rain overnight. The first people started waking up at around 6am on Sunday morning, partly prompted by one of the couple camped outside who came inside briefly around then. Allen and Sue were keen to get back to their car at Otaki Forks so they could get home early, and they were away by about 7am, dragging Dave behind them, who was needed so he could be dropped at the Waikawa road-end in order to collect the van and bring it back to the Forks. Before they left, however, Steve (who knew how to use the timer on his camera) made sure to get a nice, group photograph of everyone. The couple with the dog and the family group were away next, but everyone else in our own group took a bit longer to get going. It wasn’t likely to be a long day, at least compared with the previous day, and so it took until about 7.45am before the rest of us were packed, ready to leave and walking again. Incidentally as a bit of mostly useless information, the Terramap of the Tararuas folds really nicely if you’re going on a similar route to ourselves and stopping at the hut overnight. The hut itself is near the edge, duplicated on both sides of the double-sided map. This meant that for all of Saturday we were walking from top to bottom of the map, from Waikawa to Waitewaewae. 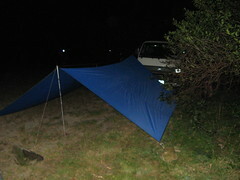 On Sunday morning I pulled it out and neatly re-folded it to the other side, and once again we were walking from the top to the bottom, from Waitewaewae Hut to Otaki Forks. After a brief discussion, we decided to avoid the first part of the track from Waitewaewae Hut, which is known for it’s fluctuating altitude, and instead wander around the curve in the Otaki River, which was all flat. We’d reached the big orange triangle, at the intersection of the Otaki River and Arapito Creek, shortly after 8am. By this time I was the only person remaining in our group who’d done this before, and unfortunately I had some fake memories of the incident. My specific memory had been that there was some climbing up above the creek to the track from this point. This memory also seemed completely logical after seeing that there was an obvious track going up the hill from that point. The further we climbed, however, the less obvious the track became, and I’m now wondering if it only existed because so many other people had had the same false memory that I’d had. Or perhaps it had something to do with the exact placement of the big orange triangle down at the river level. After a couple of minutes, Steve asked me if I was sure that we were going the right way. I admitted I wasn’t, and so we decided we’d probably be better off going back down and simply following Arapito Creek for about 200 metres, to the point where the map indicated that the main track crossed it. The logic in my mind had told me that since I’d remembered another track, this creek must certainly have been quite difficult to navigate. It wasn’t of course, and within a minute we were practically walking on a highway with orange triangles every 30 seconds. From here there was an uphill climb of about 250 metres to a plateau, although the track tends to undulate up and down for a bit which probably makes the climb a little further. Kerry wasn’t having quite so much trouble with her knee any more by now, especially having gotten away from the uneven and hard ground of the riverbeds that we’d been walking along for nearly all of the previous day. (My accidental guiding up and down a very steep section earlier probably hadn’t helped, however.) We still took things quite slowly, however, with no real reason to rush. I’m unsure exactly what time we reached the plateau’s high-point, but it was probably roughly 9.30am, after which we began to descend and very quickly found ourselves walking in Saddle Creek. The track from Waitewaewae Hut back to Otaki Forks zig-zags frequently over Saddle Creek for about 2 kilometres before heading up the hillside, to the extent that it’s often easier to simply walk in the creek than to keep following the track up and down beside it. In our case, the remaining seven of us went at our own pace and we spread out quite a lot, occasionally regrouping. I quite enjoy it when this happens because it’s a nice change from constantly catching up with people, and I tend to make better decisions about where to put my feet when I can see further ahead of me. A little after 10am, though, I caught up with Andy, Lesley and Sylvia, all of whom were crowded around a tree. It turned out that Sue, from the other group, had left us a note, and it was interesting reading. The previous afternoon, one of them had had an accident and slipped over in the creek, twisting an ankle. After attempting to walk her out, it’d quickly become clear that doing so wouldn’t be possible. Ray, also from the other group, had decided to activate his personal locator beacon, which I later heard him refer to as his pocket helicopter. 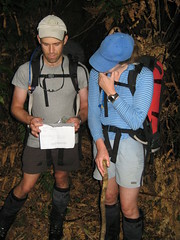 Ray and Sam had then walked back to Otaki Forks to raise the alarm that way in case the beacon failed. Within a couple of hours, however, a helicopter had arrived and the injured person had been flown out. So that helicopter we’d heard the previous evening had actually been for them after all. The note went on to say that they’d camped in the surrounding area that night, even though we couldn’t see anywhere nice to camp no matter how hard we looked. It must have been quite an awkward night. According to the note, they’d left about 90 minutes before we arrived, so they probably weren’t too far ahead. The others carried on while I waited for Steve, Marie and Terry to catch up, if only to see the looks on their faces. We re-grouped again about half an hour later (about 10.50am), after those in front had stopped rather than overtake the family group that’d left the hut before us. We actually weren’t far from the turn-off point from Saddle Creek; once we got going again, we’d only been walking for 5 minutes before we unexpectedly ran into our friends from the other group. They’d been waiting for quite some time for us to show up. After having had some issues getting around an active slip on their way in on Saturday morning, they hadn’t yet decided whether to continue along that way or to follow the river instead. If they did the latter, they also didn’t want to go down the river without us knowing about it. An added complication was them having had to divide up everything from an extra pack, since Sarah had been flown out without taking everything with her. Most of this was figured out already, but Steve helped out by carrying an additional pack which by now was almost empty, strapping it to the back of his own. After some discussion, we all decided to continue back on the track. Nobody knew what to expect from the river, whereas we knew that the main track was quite easy once we’d gotten around the slip. Our group was walking again at 11.15am, leaving Saddle Creek behind and immediately finding the old log hauler, which is placed right next to the track, and overtaking the family group who’d sat down behind it for a snack or early lunch. 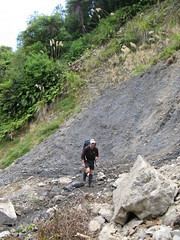 Much of the track between Saddle Creek and Otaki Forks is wide and flat. In fact, the old rails that were used by the log hauling engines continue to exist along some parts of the tracks. At 11.30am we reached the main obstacle, which is where the track hits quite a large, active slip. From here it’s necessary to climb up and around the top of it, using a much worse track that won’t be permanent for as long as the land continues to get washed away over time. Getting around it only takes on the order of 5 minutes, but the sudden difference in terrain could be quite a shock after a while of flat, wide tracks. Steve on the final leg. We returned to flat, wide tracks soon enough on the other side, however. Those of us up the front got ahead quite a bit, and we stopped for some lunch at midday, triggered by having caught up with the couple walking their dog. From here the whole walk out was much less structured, though. Once Steve decided to get up and leave, I followed shortly after, and we were almost immediately out from under the trees and into chirping cicada country. Everyone followed at their own pace, with many people apparently stopping along the way for a swim in one of the nearby rivers. By 12.45pm, I’d reached the grassy plateau just above Otaki Forks, where the Waitewaewae Track meets the track up to Field Hut. This had definitely changed since last time I saw it. In particular, there was now a 2 metre wide lawnmower track through the grass, with a sign indicating that the marker poles should be followed back to the forks. At first I thought that DOC had simply clearly mown the original track so that people would stick to walking in one place, rather than wandering all over the field. After a few minutes, though, it became clearer that this track didn’t seem to be going exactly where I thought it was. I did end up back at the Forks, but it was probably about 4 or 5 times longer than the original track, which is much more direct. Presumably DOC wanted to make something that had a shallower gradient, considering how much Otaki Forks is frequented by people who just want a short circular walk, or who want to get to one of the nearby rivers. There’s a new very grunty bridge there now, too, which in any other location would look like a monstrosity (which is exactly what has occurred with the new DOC bridges in places like Mitre Flats). 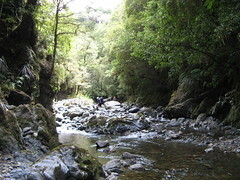 At Otaki Forks though, it probably makes some sense because so many people visit. Another tramping club was having some kind of children’s camping picnic on the other side of that bridge. Those kinds of things frighten me, and I decided to go sideways slightly and walk over the old swing bridge instead. Half way across I looked down and noticing that the water in the river was only ankle deep, I wondered why I hadn’t just waded across. The time was now past 1pm and I thought that Dave would almost certainly be back with the van. Looking around however, I couldn’t find him or the van anywhere. Dave arrived with the van about 20 minutes after I had, and I found out later that after a rather fast 3.5 hour run from Waitewaewae Hut to Otaki Forks, Allen and Sue had taken him to the Brown Sugar Cafe in Otaki for a coffee, which explained his lateness. Meanwhile I found the club bus, in which Ray and Sam were sitting half asleep. We went back down to the field near the bridges and threw a frisbee around for a while, as everyone slowly trickled in. It was a fun trip in the end, made even more exciting after hearing about the helicopter adventures of those in the other group. Apparently helicopters on club trips are something to do with Ray and Sue being present, so I might have to take that into account when planning what I sign up for in the future. 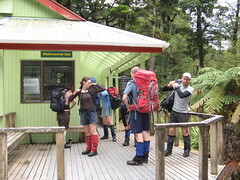 This entry was posted in tramping and tagged bagged:waitewaewae hut, navigation, tararuas, tramping, wellington tramping and mountaineering club. Bookmark the permalink. Interesting read. I came down to YTYY from Anderson’s Hut recently 07-01-2010 and this looked like a really nice spot. Saw two big brown trout in the river near the swingbridge. Nice walking to do in summer with wet feet and all. Thanks, and yes it’s a nice place. I’m hoping to get back there in a few weeks or so.